Home » Island People » Art, Music, Culture » Carnal Pleasures. Tune in! Daphne in the sunny Silver Lake studio of WOVV. Carnal Pleasures inspires listeners to prepare simple, affordable gourmet food. It premiered on Ocracoke's community radio station in late fall 2011. 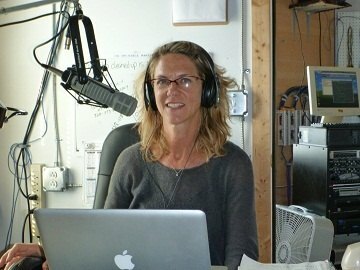 The two hour show, over half of which is music, celebrates eating, drinking and living a good life on Ocracoke Island. Topics have ranged from foraging for meals on Ocracoke to exquisite foraged truffles. Carnal Pleasures is a textured exploration of the mix between high brow dining and down home delights. 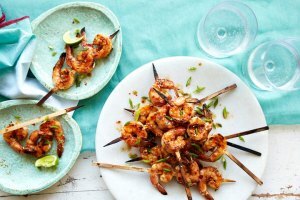 Host Daphne Bennink attended a football party and talked about the satisfying savory crunch of game time food. 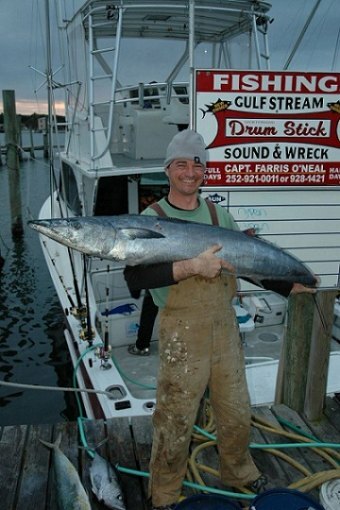 She interviewed Aaron Gallaher about his epic offshore fishing day (aboard the Drumstick), when he reeled in a 500 lb. blue marlin (released it alive) and came back to the dock with a citation wahoo. The broadcast brought the thrills and challenges of sport fishing to life. Aaron and his citation wahoo. Listeners then learned Daphne's favorite methods of cooking large, meaty fish for a table of family and friends. WOVV is "one of the coolest things in a long time," said Daphne, who wanted to get involved with the young radio station. She credits Lisa Landrum and Hurricane Irene with bringing Carnal Pleasures to the airwaves. Lisa is a manager at The Back Porch Restaurant, which Daphne owns. Lisa persistently encouraged Daphne to run with the idea for a radio show. The slow season after Irene breezed through created time in Daphne's busy schedule. Daphne guides two foodie offshoots of The Back Porch: Corner Crepe and Back Porch Lunchbox, and is part owner of another standout eatery, Eduardo's. Daphne also has a realty business, a husband, four children, and a dog. "I thrive with a gun to my head," she said. To make sure Carnal Pleasures continues to air each Tuesday from 10 a.m. - noon on 90.1 FM during the busy season, she will pre-record and rebroadcast some shows. On the show, Daphne plays a mix of new and international music. Right now, her favorite band is Beiruit. You will likely hear bands in the tune of The National, Modest Mouse, Cat Power and Radiohead, said Daphne. Daphne starts a playlist with a few songs and adds to it over a few weeks. The music inspires the show, she said. Daphne loves finding new music. She listens to friends' recommendations, to Pandora, and online to a French station she admires. The name Carnal Pleasures occurred to her "because maybe people will listen, thinking it's risque." When "Donald Davis thought it was hilarious" the name stuck, said Daphne. The name fits. The show is warm and sensual. Daphne invested in a handheld recorder, and you join her as she wades the sound foraging for mussels and seaweed. You hear water lapping as she narrates the touch of winter sun and describes a vast sky. Her friend and fellow restauranteur, chef Michael Schramel, of The Flying Melon, often turns up on the show. He is unassuming and dry where Daphne is enthusiastic and curious. Trust me, it makes for great radio. "I am passionate about food," said Daphne. She sees a lack of intimacy between Americans and the foods we eat, and she champions integrating our meals with our lives. "So much of the best food and cuisines are so simple," said Daphne. Make your own mayonaisse! she encouraged listeners last week. It is an easy way to make flavors more clean and robust. Crush a clove of garlic in the mayonaisse and voila --aioli! The show is so good it ought to be syndicated, WOVV founder Robert Raborn told me. It made me tune in, and so should you. Tuesday morning from 10 -12 on 90.1 FM on the radio dial, or straight to your internet ready machine at wovv.org. I have been a board member of WOVV since 2009. My three year term ends this fall. A public meeting will be held Tuesday, March 6 at the community center. A potluck dinner at 6 p.m. will be followed by the meeting at 7 p.m. Please come out and get involved!